Sometime after August 25th (or so) something changed in the Yakkety ISOs that make them no longer boot under QEMU in UEFI mode. However, the ISOs do work fine still on the physical UEFI hardware I've tested (3 different systems). I'm not sure about other VM solutions like Virtual Box, etc., as I haven't tested under anything other than QEMU. But under QEMU, UEFI mode installs are definitely broken. Thus far I've only tested with a Xenial host, so I'm not sure whether this problem exists with a Yakkety host + Yakkety guest. This problem also doesn't seem to be the result of any changes in QEMU (and related) in Xenial. With a Xenial host, you can still do UEFI mode installs fine under QEMU when the guest is using the 16.04.1 ISOs, and likewise when the guest is using the latest Xenial daily (16.04.2 WIP) ISOs. So the problem seems to be only when using a Yakkety guest in UEFI mode. Note this problem effects both Yakkety desktop and server ISOs (when installing under QEMU in UEFI mode). FatDiskIo: Cache Page OutBound occurred! !!!! X64 Exception Type - 0D(#GP - General Protection) CPU Apic ID - 00000000 !!!! The pattern AFAFAFAFAFAFAFAF is used to fill memory that's being freed, for debugging purposes. 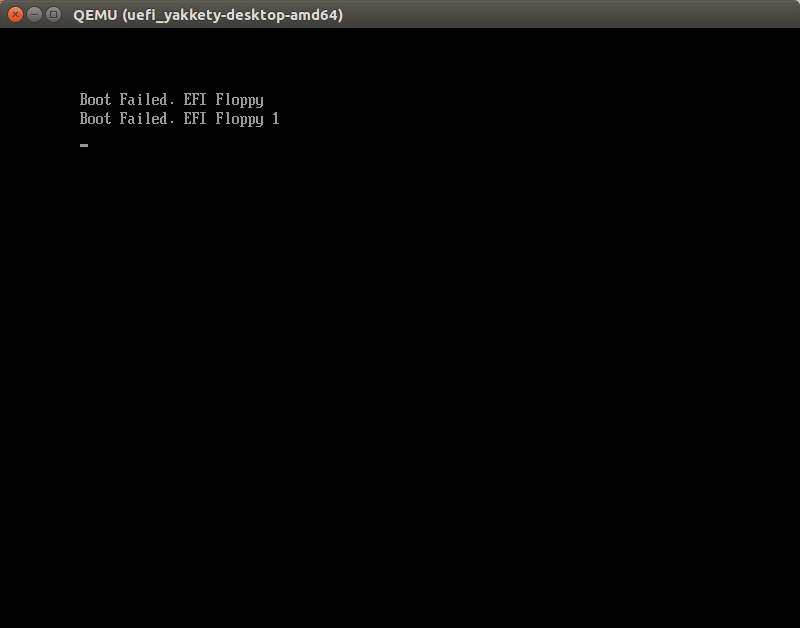 So, your BOOTX64.EFI application dances fandango on core. @Laszlo - thanks for the debugging tips! I'm getting the same result that you are. I found the error in shim. It is a double-close (on error handling) of the root directory of the filesystem. I'll submit a patch soon. @Laszlo - awesome, thanks! Do you happen to know what version introduced the bug? hang. This issue only affects certain systems. You guys just need to rebase Yakkety's shim package on top of an upstream git commit that comes after 7052e7530755. (Alternatively, you can also backport 7052e7530755, but I guess Yakkety's release schedule might allow another rebase at this point.) You are currently based on 14a5905, which does not include the fix. @Jason -- according to the upstream fix (7052e7530755) that Yakkety is currently missing, the upstream regression comes from upstream commit 4794822. That commit (i.e., the regression) is between the 0.9 release and 14a5905. According to <http://changelogs.ubuntu.com/changelogs/pool/main/s/shim/shim_0.9+1465500757.14a5905-0ubuntu1/changelog>, the previous ubuntu shim version was "0.8-0ubuntu2", while the most recent one is "0.9+1465500757.14a5905-0ubuntu1" (including the regression but not its fix). So, in Ubuntu, it was the latest shim rebase (dated "Tue, 26 Jul 2016 16:48:32 -0400") that introduced the bug. Triaging, this is my problem. Given that it will take a bit of time to get a new shim signed; we'll also need to ship fallback.efi on the CD (and it makes sense to do this anyway), and on disk in general. I've added the tasks for debian-cd and grub2 to do so. @Mathieu - I've been doing some quick experiments with fallback.efi on the ISO, and I'm not sure that alone will fix things. So although fallback.efi can work around the X64 Exception in the Yakkety version of shim, it still doesn't give you a bootable installer. If there's something obvious I'm missing, please let me know! Also, do you have any idea why this faulty shim code path is taken when running under QEMU + OVMF, but does not seem to be taken when running on physical hardware? @Jason, there are two separate topics in your question. First, controlling the boot order from the QEMU command line (i.e., filtering and/or reordering the persistent UEFI boot options that (a) exist from earlier in the varstore, plus (b) OVMF's platform BDS regenerates at every boot). propertiey, which in turn necessitates the modern, separate notation for backend/frontend. This will (a) capture the OVMF log; (b) give you access to both the QEMU monitor and the guest's serial console -- switch between them with [C-a c]; (c) create a virtio-scsi disk and CD-ROM for the guest, with the (target) system disk and the installer ISO, respectively; (d) assign bootindex=1 to the system disk, and bootindex=2 to the installer ISO. The upshot is that when you first boot the VM, the installer ISO will be launched (because the system disk is still empty), but after installation, the VM will boot off of the system disk. If there is a (QEMU default, or manually configured) virtual NIC in the VM as well, then PXE boot will *not* be attempted. The reason is that you assign a bootindex to at least one device, but no bootindex is assigned to the NIC. This will cause OVMF to filter out any UEFI boot options (created manually or automatically) that would refer to the NIC. If the yakkety installer still doesn't boot with the above command line snippet (*and* with the shim bug fixed or worked around), then I'd say the installer ISO is malformed in some other way. Also, I should mention in passing -- again -- that Launchpad is completely retarded for truncating comments in the full bug view. It doesn't offer any option to see both the full bug and full comments. How stupid is that?! Are people who take the time to explain things in detail really considered "verbose"? Do their comments really deserve to be abbreviated in the full bug view? "Your comment is too long, so users who care about it should click another link, and *replace* the full bug view with a sole comment". @Laszlo - thank you very much for the detailed explanation! Sounds like your tips, plus /EFI/BOOT/fallback.efi being present on the ISO, should be enough for me to work-around this issue. I'll let you know how it goes. @Laszlo - darn, no luck. Following your recommendations, PXE booting is no longer attempted, but I still end up at Shell> and the installer doesn't launch. I'm attaching the isolated test script I'm using ATM. If I try it with the latest Yakkety desktop daily ISO, I hit the above hardware exception (as expected because of the issue in `shim`). However, if I try it with the same ISO modified to include /EFI/BOOT/fallback.efi, it goes directly to Shell> rather than launching the installer. Please let me know if you spot any goofs in my script or can think of anything else to try. @Mathieu - under the assumption that there is more to this than just the issue in `shim`, or at least that the presence of fallback.efi can't fully work-around it, do you have any suggestions as to where I should go looking for other things that have changed between the Yakkety and Xenial ISOs, things that might be interacting with the `shim` bug in odd ways? As Laszlo mentioned, this can affect other systems than QEMU. I definitely can't boot the ISO on my thinkpad when shim debugging is enabled. I'm working on preparing the shim update since yesterday. I can get you a working shim if necessary for testing for a custom remastered CD image. @@Mathieu yeah, if you can get me a custom ISO with an updated shim package (doesn't need to be signed, I'm not using secure boot), then I'll giving a thorough testing under QEMU and on all the UEFI hardware I have access too (6 different laptops, 3 different desktops). Apparently this affects me as well, with Kubuntu 16.10 (beta2 and all subsequent daily builds), on a self-assembled PC (no QEMU, no laptop). If it helps in anything, I'm using Asus Z170P motherboard. @Mathieu - I was on vacation last week, so I wasn't in the loop on IRC. What's the current status of this? Does it seem feasible that the fixed shim package can be signed (and FFE'd) in time for 16.10? Or are we already at the point where reverting to the shim 0.8-0ubuntu2 package from Xenial (with whatever needed version trickery) is the only realistic hope for fixing this? If there's anything I can do to help, please don't hesitate to ask! We're still waiting for shim to be signed by Microsoft. I don't expect issues with a FFE for the new shim, since it fixes some important bugs. If it doesn't make it though, we can provide the new shim as a stable release update. Given that we're very close to release however, it seems like it's time to do a revert for now. - This effectively reverts shim to 0.8-0ubuntu2. Hmmm, today's yakkety-desktop-amd64.iso (sha1:494bc027be3d29c494eb17d057dcc51cdfc6f50b) is seemingly still using the broken shim package? I'm guessing there's something special about how the shim package gets onto the ISO as it doesn't seem to be listed in yakkety-desktop-amd64.manifest? !!!! Find PE image (No PDB) (ImageBase=000000007E62D000, EntryPoint=000000007E64A000) !!!! Okay, the 20161005.1 ISOs seem to have done the trick. Tested the desktop and server ISOs under QEMU+OVMF, plus tested the desktop ISO on a slew of UEFI hardware. No issues encountered shim-wise. I'll test the server ISO on UEFI hardware shortly, but there are a few other things I need to finish up first. Big thanks to everyone who helped on this! And I sanity checked the server ISO on the same slew of UEFI hardware... no issues found. Turns out we didn't need grub2 for this case since we reverted to the "old" shim. Zesty now has the new shim and we'll proceed with the SRUs shortly. Accepted shim into xenial-proposed. The package will build now and be available at https://launchpad.net/ubuntu/+source/shim/0.9+1474479173.6c180c6-0ubuntu1 in a few hours, and then in the -proposed repository. I'm not sure whether it was a truly representative test, but it works fine with latest Xenial daily desktop ISO under QEMU + OVMF, and these dailies do have xenial-proposed enabled. I recall that d-i needed to be rebuilt for a new shim to be properly represented in an ISO... has this happened yet? > represented in an ISO... has this happened yet? (provided we get a d-i rebuild in zesty). The latest zesty d-i image (20101020ubuntu487) build on 2016-11-07 should include the right shim already. An upload of shim-signed to trusty-proposed has been rejected from the upload queue for the following reason: "needs adjusted versioned dep on grub2-common; drop ref to LP: #1624096 from changelog".